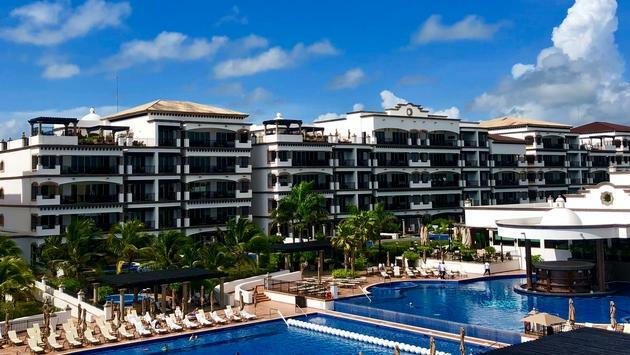 Nestled in a private enclave between the hustle and bustle of touristy Cancun and the lively authenticity of historic Playa del Carmen, Grand Residences Riviera Cancun is exactly what a carefree vacation is all about. The resort’s ability to successfully blend unpretentious luxury with laid-back toes-in-the sand vibe makes for a perfect vacation. While guests looking for total relaxation will definitely find it here, those looking for adventure will also find this location is perfect for venturing out. Affiliated with the prestigious Leading Hotels of the World, the 144-all suites resort offers a range of elegantly appointed accommodations. From spacious 635-square foot junior suites to its four-bedroom 8,762-square foot penthouse presidential suite, there’s something to meet the needs of every guest. 103 ocean-view suites boast private terraces. First-floor master suites feature private pools. Soft luxurious bed linens and towels and deluxe Bvlgari bath amenities are just some of the elegant touches that give guests that pampered feeling. 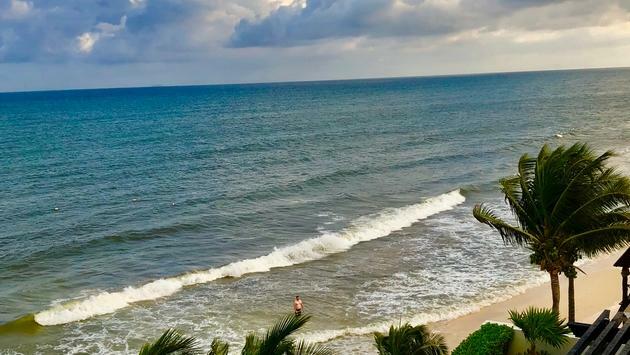 There’s nothing better than greeting the morning sunrise slow and easy with a rich cup of Mexican coffee on the terrace of an oceanfront one-bedroom master suite. And at night, soaking in a private patio Jacuzzi with a glass of wine under the stars is simply divine. I must say, the service at Grand Residences is impeccable. Beginning with the resort’s luxury private transportation arriving at the airport with cold water and towels to a warm lobby greeting with champagne and margaritas, the stage was set for a perfect stay. Every need seems to be anticipated. 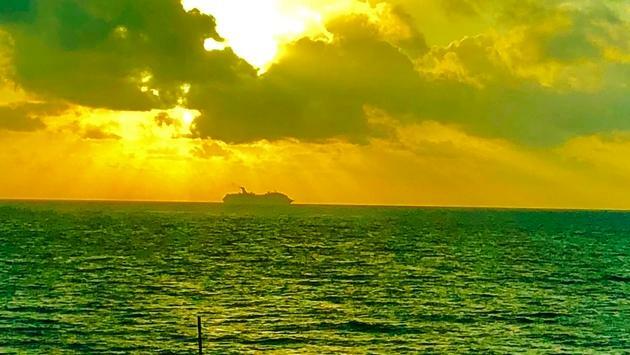 One traveler aptly noted, “It’s as if you think it and they’re already on it.” This is true from housekeeping, room service and bellmen to the amazing food and beverage staff. Due to the resort’s private off-the-beaten-path location, a stay at this Mexican Caribbean hideaway is quiet tranquil paradise. It’s so easy to relax here—by one of the resort’s four pools, on the white sand beach, or the private patio of your suite. Additionally, Grand Residences offers a variety of on-site activities for active guests. Snorkel equipment, tennis rackets, and golf clubs are readily available at the poolside sports deck. Guests can hop on a bike to explore the local area surrounded by mangroves and a nature preserve. The activity center offers water polo, beach volleyball, salsa classes and yoga for beginners. Bringing along the family? That’s perfect, as there’s even a teen club and an adult-supervised kids’ club to keep the youngsters busy. Adults love the indulgence of its Zen-like luxury spa with a host of massage therapies. My first day’s session was so incredibly relaxing; I booked a longer one the following day. Afterward, I found myself sipping on cucumber water in a pillow-lined lounger realizing I was more chilled than I’ve been in a very long time. A visit to the nearby quaint fishing village of Puerto Morelos is a treat. This serenely peaceful location is ideal for biking or strolling along its Malecon. Its tourmaline waters are filled with boats and fishermen returning with their daily catches, and life here seems so simple and easy. The spirited bohemian town of Playa del Carmen is a mere 30 minutes from the resort. With a myriad of restaurants, shops, historic churches, and some trendy boutiques, the town is a fun blend of Old Mexico with an eclectic hippie vibe. You’ll find bars with rope swing seating, cenotes (underground sinkholes), mariachi bands, picturesque vistas, and a spirited nightlife. Its inviting beaches are the perfect place to throw back a cold one under a shaded palapa. 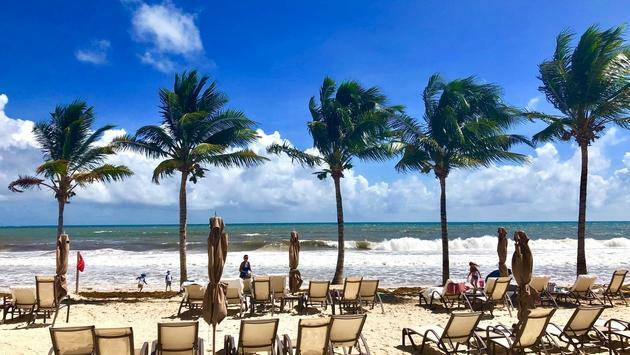 For guests wanting to further explore the historic treasures of Riviera Maya, resort concierge staff members are experts with local information and setting up tours. These venues include ancient Mayan ruins, its myriad of underground rivers, and fascinating eco-parks. Whether it’s a day of snorkeling on the coral reef or adventurous exploration, returning to the resort is a total respite. Cozying up to the Heaven Beach Bar or Pool Bar for a Caribbean cocktail while being caressed by warm sea breezes was pure paradise. Then there’s that cool inviting infinity pool with its unforgettable breathtaking ocean and palm-tree lined views. Dining at Grand Residences was one of the best culinary experiences I’ve had in Mexico. Though guests have a choice of a European or All-Inclusive Plan, the All-Inclusive is the way to go as the resort dining here is outstanding. El Faro Grill (a tribute to Puerto Morelos historic lighthouse) offers fresh seafood and prime steaks with a Mediterranean flare. Coupled with incredible views of the ocean, pools, and gardens, this is a great place for breakfast, lunch or dinner. Flor De Canela, the resort’s gourmet Mexican restaurant provides equally spectacular views of the Caribbean Sea. They feature delectable dishes while celebrating the art, traditions, and music of Mexico. A mariachi band was the perfect accompaniment to a mouthwatering dinner. For more casual dining, the outdoor Heaven Beach Bar & Grill’s menu items can be enjoyed on its tropical terrace. The Lobby Café and Bar sports a chic, relaxing ambiance where guests can order gourmet coffee, cocktails, wine, beer, spirits, and appetizers. Afternoon tea, a resort amenity, was a wonderful surprise that I’d never seen offered in any another Mexican resort. Impeccably served on their picturesque patio terrace, it included a variety of sandwiches, cakes, and scones accompanied by a selection of fine teas. With so many elegant touches, top-notch service, stunning location, and relaxing ambiance it’s easy to see why guests return again and again to Grand Residences. For this is the place where grand living meets barefoot luxury at Mexico’s gateway to Riviera Maya.